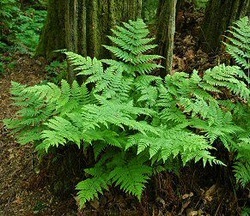 The northern lady fern is a light green plant that tends to grow in a circular shape. Growing from 24 to 36 inches tall, it is the most common plant in the understory of the temperate deciduous forest. This abundant organism is a common food source for animals such as bears and elk.